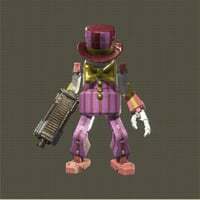 Rampaging Medium Biped is an Standard Machine enemy in NieR: Automata. "A machine lifeform that has become violent after infection by Eve. Will attempt to attack androids as if they were prey. The armor-plating on its head has been removed, revealing teeth-like metal pipes that nevertheless have no functionality as a mouth, It is theorized that either this modification was implemented due to self-optimization, or that possibly some alien race created them in likeness to themselves, though neither of these are proven. A machine lifeform that turned aggressive after the emergence of the tower. They will attempt to cannibalize other nearby machine lifeforms and combine with them." I had some problems to find the Rampaging Medium Biped in the amusement park. Data for this enemy got unlocked for me when I killed the Goliath Tank. Killed the friendly one behind the Rabbit statue during route C and got the unit data, the one behind the iron portal didn&apos;t work.